Music of Katherine Hoover has been widely performed and recorded on more than two dozen CDs, including three previous CDs on the Parnassus label. Hoover is particularly popular among flutists, since she has written prolifically for her own instrument. 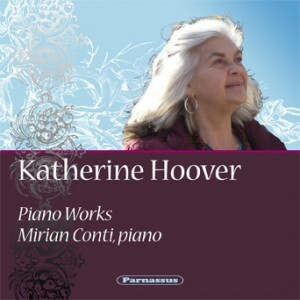 However, Hoover’s piano music is less well known, and the current CD represents the first recording devoted entirely to her piano works. The music on the disc is all first recordings, performed under the composer’s supervision by Mirian Conti. Extensive information on Katherine Hoover is available at www.katherinehoover.com. This release marks the Parnassus debut of the excellent pianist Mirian Conti, whose recordings have previously appeared on the Albany, Toccata Classics, Island, XLNT, Koch International and Steinway & Sons labels. Born in Argentina, Conti completed her education at the Juilliard School of Music, where she now teaches in the Evening Division. When the Juilliard School celebrated its Centennial in 2005-6, Conti was selected for its list of “100 Outstanding Alumni.” She has appeared worldwide as soloist and with many orchestras, in Europe, Asia, Africa, South and Central America, Canada and throughout the US. Her two CDs on Toccata Classics have been recognized with an award for best recording of piano contemporary music by International Piano Magazine in 2008, UK. Her website is www.mirianconti.com.